Running a business can be tough, especially when you have pesky competitors jeopardizing your bottom line and stealing away potential customers. Fortunately, there are competitor analysis tools out there you can use to get the drop on your competition so you can blow them out of the water. Today, I’m going to share some of my favorite advanced tools for analyzing the competition. Some you may have heard of and others you might not have thought about as a spying tool. Competitor (or competitive) analysis is the act of interpreting data that was previously collected from a competing business. By analyzing that kind of data, a business can get insight on why a competitor is doing differently to earn them more sales so they can better adapt their own business. Backlinks – Links to external pages in the site being examined. Link popularity – Number of backlinks that point to a particular website. Content performance – Overall popularity and effectiveness of content such as blog posts in terms of garnering social media and on-site engagement, driving traffic and conversion. Search engine ranking – The position in which a web page is displayed in search engine results when keywords are queried. Organic keywords – Terms that are targeted to perform well in search engine rankings, but that weren’t purchased in exchange for a boost in rankings. PPC (pay per click) keywords and ads – Terms selected for search engines and advertisements that were purchased to promote a website and business that usually includes the dollar amount that was spent and the ROI (return on investment). Traffic – Number of visitors that viewed a page where unique page views indicates first-time visitors. These are the most popular types of data that are presented by many competitor analysis tools. Not all tools provide every type of data, but some offer a few of them in greater detail. Here’s a list of advanced and quality competitor analysis tools you can use for your business. You don’t need to use all of them, but you have an ample list to choose the one or more tools that work for your business. WP Checkup lets you check your site and your competitors’ sites for performance, security and SEO. Enter any domain in the search box to see an overall score as well as a score in each category. You get suggestions on how to increase your site’s scores and also see where your competitors are dropping the ball so you can swoop in and take the ball away. You can start a scan now for free and if you want to enjoy unlimited scans, you can sign up for free. With Open Site Explorer, you can enter a URL and view the backlinks of your competitors. You can also see the most popular pages for a given URL as well as other details such as domain and page authority, and the number of established links. You can submit a search for free, but if you need to run them on a regular basis, there’s an option to upgrade. There are also additional tools available after switching to premium. Interested in Open Site Explorer? Google Adwords has a tool called Keyword Planner. You can search for the keywords you’re targeting in your SEO strategy to see how many times they’re used in organic searches and how much competition there is for the same keywords. Keep in mind that you need a Google Adwords account to use this tool. If you sign up for a new account, you’re required to create an add and enter your credit card details before you can access the Keyword Planner. However, you can create an ad, then remove it straight away so you can avoid being charged and use this tool instead. Interested in Google Keyword Planner? SEMRush is a popular tool because it’s a one-stop shop for competitor analysis. It provides a detailed overview of your SEO including suggestions on how to get more traffic. It also gives comprehensive reports on your paid advertisements, social media presence, backlinks and engagement in your content. The analytics dashboard is well organized and easy to follow despite the sheer volume of analytics that’s displayed. It’s also used by many of the most popular companies including Amazon, eBay, Disney and Hewlett-Packard. Ahrefs is another popular tool for competitor analysis and SEO that includes a multitude of features under on roof. You can research keywords, track your traffic and view your competitor’s backlinks, popular posts, targeted keywords and organic traffic. One of the key features that sets Ahrefs apart from other tools is its enormous database of sites that’s updated daily. It also includes data entries in the billions to ensure you get analytics that are as accurate and plentiful as possible. 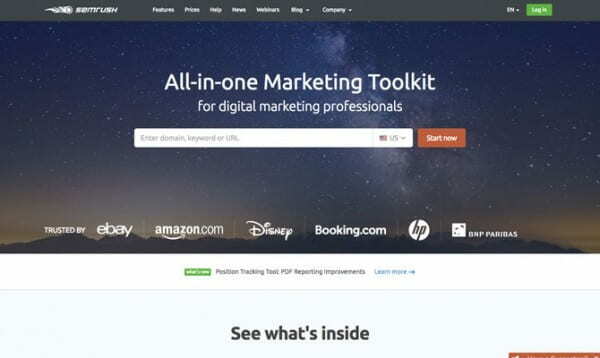 SimilarWeb’s core features include giving you detailed SEO analytics, but it also includes unique competitor analysis tools. You can see exactly who your competitors are including newly emerging ones and compare them side-by-side in these categories: traffic flow, market share, traffic sources and targeted keywords. Not only can you comparatively analyze your competitors, but you can also benchmark your business against them. You can also see the volume of referrals, sent emails, social media engagement and paid ads that other businesses have under their belt. One of the key features of SimilarWeb is that you can view all these details for both websites and apps. Serpstat has commonplace tools such as traffic insights, backlink analysis and a keyword research feature, but it also has competitor analysis tools. You can use Serpstat to see the sites that are using the same keywords in your niche as well as view which of those sites are ranking the highest. You can track how much your competitors are spending on ads, their ROI and the keywords that aren’t properly being capitalized on so you can optimize them for yourself and get ahead. Searchmetrics is a content performance researcher tool. You can check how your site compares with others in SEO, PPC, backlinks, social media metrics and keywords. If you upgrade to their Suite plan, you’re able to see these statistics for each post and page of your WordPress site as well as those of your competitors. Majestic is by far has the most compregensive database of crawled sites, social media profiles, posts and pages that inlcudes backlinks, referrers, trust ranking and content performance all in incredible detail. While other tools crawl a few billion sites per day to retreive stats, Majestic crawls hundreds of billions of sites, multiple times a day. In their history, they have crawled over three trillion posts and pages. You can see data for your own site and social media profiles as well as simultaneously compare them with your top competitors as well. 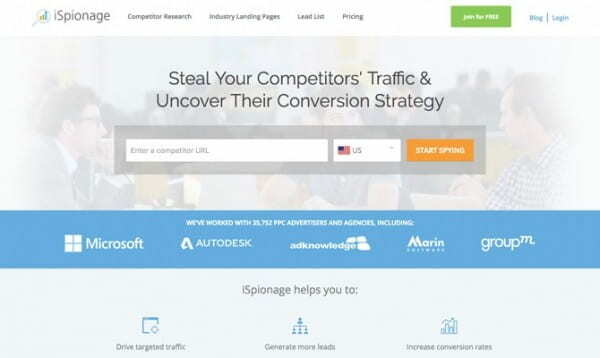 iSpionage gives you a rundown of your top competitors, then gives you data on their PPC keywords, ads and organic keyword usage. You can also see how your site compares to those of your competitors. It’s also a great tool for WordPress developers who work on client sites since you can download a white label report to send to prospective clients. WhatRunsWhere gives you a complete overview of your competitors’ ads and which ones are performing well and why so you can leverage that into your own ad campaigns. If you’re a WordPress developer, you can also send these details to prospective or existing clients for their own sites. With SpyFu, you can run a search of your competitors’ sites and see a 10-year history of their search engine (read: Google) ranking, purchased keywords, organic ranking as well every variation in their ads. You can see what worked for them to leverage your own SEO and marketing strategies. SpyFu also provides tools to help you recognize poor-performing keywords you’re using so you can choose better ones. Rank Signals has both competitor analysis and content performance tools. Not only can you see how well your content is doing, but you can also check on your competition’s content as well. Rank Signals also gives you detailed stats on backlinks and social metrics. It also helps by identifying where there are broken, deleted or spam links so you have the opportunity to fix them to improve your SEO. SE Ranking is unique because you track the keywords you use and how effective they are in search engines in real time. You can also monitor your keywords as often as you want. You can also track your competitors’ major organic keywords ranking, PPC ads, traffic channels and various SEO metrics such as backlinks in great detail. BuiltWith is a search tool that lets you see how any site has been built by listing the platform it’s built on, the hosting, shopping carts and tools they use and a ton more. In the case of WordPress sites, you can see what kind of plugins are being used as well. It also has Chrome, Safari, Firefox and Edge browser extensions so you can quickly check up on any of your competitor’s sites as soon as you visit them. Running a business is already challenging enough without having to worry about being beaten by your competitors. Any one of these tools should help you get closer to devising a strategy to give you the competitive edge. How do you keep your competitive edge? What tools do you use and which ones aren't included in this list? Feel free to share your experience in the comments below. Wow! Great tools. Thanks for this article. Bookmarked for future reference. :-) A little spying never hurt. The big corporations do it all the time. Hi! Thanks a lot for this list! I checked some these tools and found the most convenient ones for me. And I’ve already bought Serpstat plan! That is great Mark. Glad that you took action on the info you received. I’ve (with some admitted bias) one more platform to add to your list. Have a look at gShift () which includes competitive discovery, advanced keyword research, keyword position comparisons and includes an integration with Majestic for competitive backlink data. gShift Competition Reports are particularly popular with Agencies as both pre-sales and ongoing competitive reporting tools. keyword investigation should be the number one step to each flourishing the academic and ethical needs to improve the style dissertation and thesis – . a key-word research tool, a key-word notion tools and a keyword analysis device are a must must any search engine optimization professional and webmaster. google adwords keyword device, google indicates and seek term researches are nevertheless one of the most prized at no cost equipment which can be available out there. A key-word research tool is a fantastic tool to use. It will help you narrow down a niche you can target to get more visitors. Most people go for the most used keyword, but not realizing that the competition is fierce. Sometimes choosing a good keyword with less competition is just what we need to get the head start we are looking for, but knowing what competitors are up to is also good and in the business world it is doggy eat doggy world so to speak. You will have to buckle down and keep up to avoid being left behind. Anyhow, hope you are enjoying our blog. Great list! I used some of them – they are all cool. Now I’m working with SE Ranking – I like their keyword research tool for Competitor research. You didn’t mention that, but it’s really awesome. You can get the list of all competitors and historical advertisers per certain query to find the most efficient. Great list. I’m using K-meta Tool and it’s a great alternative.